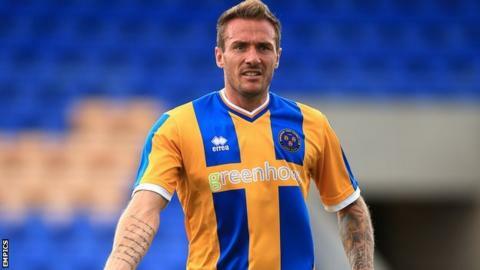 Shrewsbury Town captain Liam Lawrence says the newly-promoted side will not be feeling out of their depth back in League One this season. The Shrews returned to the third tier after one season in League Two where they finished runners-up to champions Burton Albion last term. "I think it'll be good year, we've added some quality to the side and we're optimistic," Lawrence, 33, said. "Shrewsbury's a different animal these days - we're hungry and want success." Former Republic of Ireland midfielder Lawrence is hoping his experience - including playing in the Premier League for Sunderland and Stoke City - will help Town hold their own back in League One this season. "If we do the unimaginable and do really well, Shrewsbury could be a Championship side next year," he added to BBC Radio Shropshire. "I've got an older head on my shoulders and sometimes if the players have got any problems they come to me as a go-between with the management staff - it helps take the pressure off. "I love come to work every day and I'm still playing well." Shrewsbury have both striker Jean-Luis Akpa Akpro and defender Jermaine Grandison available for their opening fixture of the season. at home to Millwall on Saturday. Both have re-signed for the Shrews after their original contracts ran out and chairman Roland Wycherley helped fund new deals for the pair.